Targ – a boar-like creature with spikes along it’s back. Generally considered to be the Klingon equivalent of a cat. At 5’9” with a forehead that looks like it could deflect a sledgehammer this all-star isn’t someone you’d like to encounter in a dark alley. 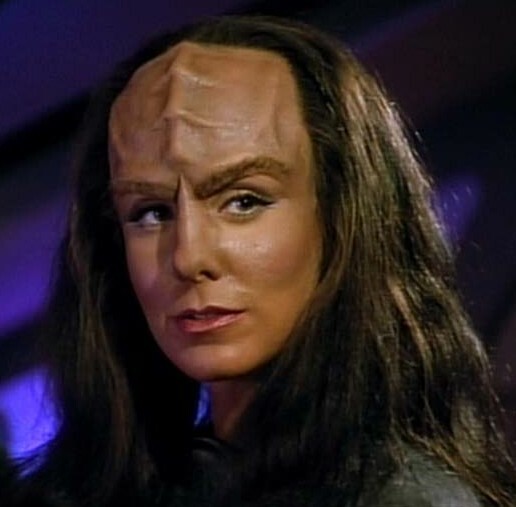 Half-Klingon, half-human and a good deal more attractive than the former, K’Ehleyr gets to be the first shuttle off my all-star hero rank because it’s hard to go past a woman who can take the piss out of Worf1. Although the character only appears in two episodes of Star Trek: The Next Generation (“The Emissary” and “Reunion”) she makes a hell of an impact. 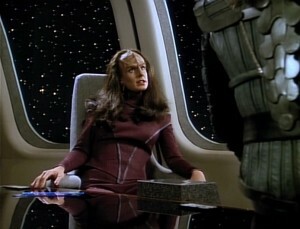 When she first beams onto the screen K’Ehleyr’s wearing form-fitting red leather and a smile that says she knows something we don’t, which is enough to pique your interest all on it’s own, but add that Worf’s prickly reaction and you’re hooked. Immediately these assets are backed up with an attitude that is confident and irreverent and the sense that, for the most part, she is comfortable in her own skin. Plus she has enough hang-ups to strangle a cat and a vulnerable side that is well illustrated in her relationship with Worf. Don't just sit in that chair, own it. On a side note I also really, really like how she doesn’t just sit in a chair, she owns it. For more information about K’Ehleyr visit Memory Alpha.